It seems like just yesterday we packed up our belongings and moved from Selle Generator Works to the United Building in the heart of downtown Akron. But as Array steadily approaches the one-year anniversary of our relocation, we are continuing to evolve, grow and are expand our team. So we’re very excited to announce that WE’RE HIRING! 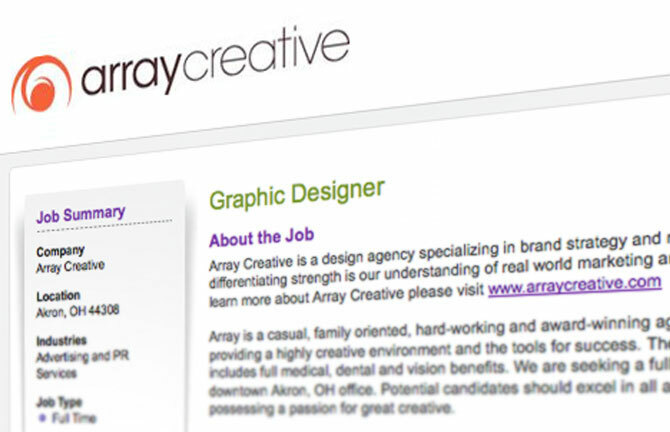 Array is looking to add another graphic designer to our agency family. Are you fun, creative, self-motivated, reliable, organized, deadline driven, efficient and a highly effective communicator?? If you can answer YES, Array Creative is looking for you! Visit http://jobview.monster.com/Graphic-Designer-Job-Akron-OH-125419229.aspx – ! to apply and learn more about the available position.